Before the days of cheap air travel, the Isle of Bute was Glasgow's holiday playground with the bustling wee town of Rothesay at its hub. It is much quieter now but the attractions of great scenery, easy walks and cycling routes remain along with the jewel in the crown – Mount Stuart. This stunning Gothic Revival home is about five miles south of Rothesay, was constructed by the 3rd Marquess of Bute at the end of the 19th century and is accessible by bus. You can't fail to see magnificent Rothesay Castle which dates from the early 13th century and is of unusual circular design. Scottish royalty stayed here at various times. In Stuart Street behind the castle is the Bute Museum which charts the island's history from Mesolithic and Neolithic to the present day. On the waterfront you will find The Discovery Centre which includes Tourist Information, The famed Victorian Toilets and the Putting Green and Gardens – the latter were instrumental in the town winning top prize in last year's Beautiful Scotland awards. Bus services can take you to Rhubodach on Bute and Colintraive a five minutes ferry trip away in the north, Ettrick Bay in the west and Kilchattan Bay to the south while cyclists will find the east coast roads are generally flat. Ascog Hall Fernery about three miles south of Rothesay is worth a visit with its beautifully restored Victorian fernery together with three acres of conventional gardens and a very peaceful spot on the southern end of Bute is St Blane's Chapel, a 12th century ruin and the birth place of Christianity on the island. Bute has three golf courses – the largest is the 18 hole Rothesay Golf Club above the town; the 13 hole Port Bannatyne course has superb views over the Kyles of Bute to the Cowal hills and Bute Golf Club's nine hole course at Kingarth takes in a magnificent vista of the Arran mountains. 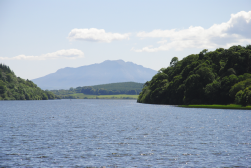 For fishermen, the inland Loch Fad, (see picture above) which has now re-opened, hosts many competitions during the year and Loch Quien is another favoured spot, together with miles of easily accessible coastline. Bute is magical for horse riding and there are two stables – the Ardbrannan Riding Centre on the southern outskirts of Rothesay and the Kingarth Trekking Centre which is about five minutes ride from the long sandy beach at Kilchattan Bay.